Radial tire with automotive-grade tread has an 8-ply rating and a 2,540-lb max load at 65 psi. 15" x 6" Steel wheel undergoes an eco-friendly PVD coating process for extreme corrosion resistance. Complimentary roadside assistance included. 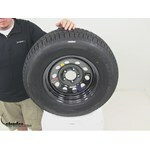 Lowest Prices for the best tires and wheels from Taskmaster. 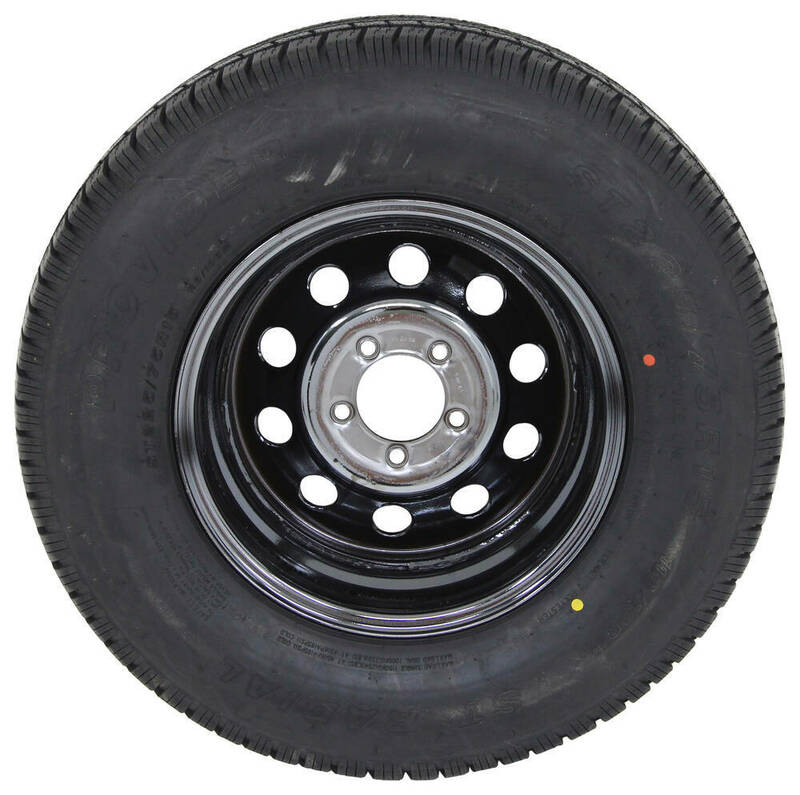 Provider ST225/75R15 Radial Tire w/ 15" Steel Mod Wheel - 5 on 4-1/2 - LR D - Black PVD Finish part number A225R645BMPVD can be ordered online at etrailer.com or call 800-298-8924 for expert service. Today we're going to be taking a look at part number A225-R645BMPPD. This is the Taskmaster Provider ST22575-R15 Radial Tire with a 15 inch steel mod wheel. The tire and the wheel assembly is gong to be idea for boat trailers, dock trailers, utility trailers and campers. We're going to have a sturdy steel wheel with a modular design. The modular design is simply just the holes that go around the wheel, gives it a unique clean, really nice look. The finish on the wheel is what's called 'Physical Vapor Deposition', that's PVD. That's a wheel coating process. It's going to create a sleek black finish. It's harder, tougher and more durable than chrome. It's a tough wear resistant coating that won't pit or peel. It's going to offer excellent corrosion resistance. It has a soft inaudible 00:00:47 rating of more than a 168 hours, and that's an environmentally-friendly technique or coating process that binds the coating to the wheel at a molecular level. That's going to be on the front and the back. The only area that's not coated is right here around the lug holes. That's because this wheel uses Improved Torque Retention, that's ITR Technology. That's going to help keep the wheel securely in place on your trailer. The stud holes are beveled which is going to offer better clamp force retention. The radial tires is going to be constructed with double-steel belts and double-polyester cords for a long life. We're going to have tread firming-belt overlays, that are going to help prevent tread separation. Going around the perimeter of the tire, we're going to have tread-depth bars that's going to offer a quick visual indicator of tread wear on our tire. The assembly meets The Department of Transportation specifications. It exceeds FMVSS requirements. A couple of specs to go over with you real quick, starting with the wheel. This is going to give us a diameter of 15 inches and a width of 6 inches. The bolt pattern on the wheel's going to five on four and a half. It's going to use a wheel lug size of a 1/2 inch by 20, and then, the capacity of the wheel is 2,830 pounds. Pilot hole diameter, that's the diameter of the large hole here in the center. That's going to be 3.31 inches. Again, the tire size is ST22575-R15. It's going to offer a section width of 8.78 inches, with an out diameter from top to bottom and fully inflated of 28.31 inches. Now when it comes to the capacity of the tire, we're looking at a load range D which gives it an 'A' ply rating. Maximum load is 2,540 pounds, it's 65 PSI. If we look right here after the tire size it's going to say 113-108M. That 'M' is going to be our speed rating, 'M' stands for a maximum speed of 81 miles per hours. That's going to do for today's look at part number A225-R645BMPPD. We sure can. You can get the Taskmaster 225-75-15 Load Range D Radial tire mounted on a modular wheel with a shiny PVD finish (like chrome, only more corrosion resistant) as part # A225R645SMPVD. 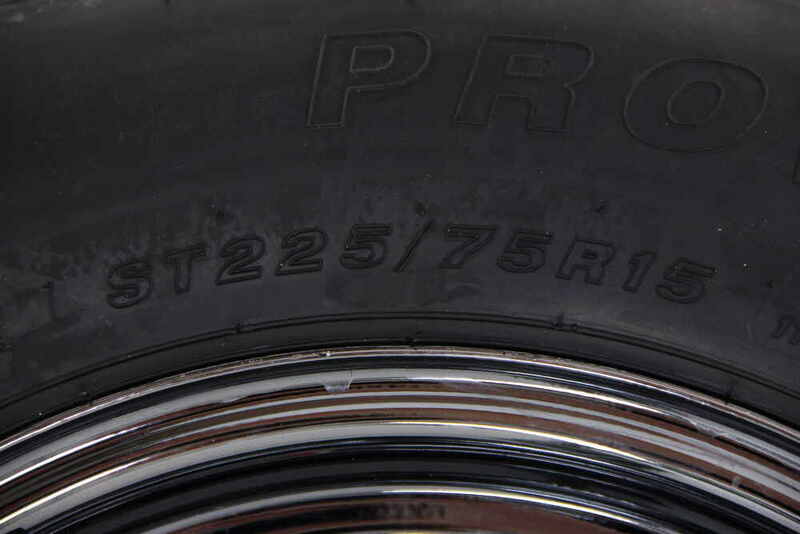 For the same tire mounted on a shiny black wheel, use part # A225R645BMPVD. Either wheel has a 5 on 4-1/2 inch bolt pattern. I have a couple options for you to consider but both don't match what you need perfectly. For a wheel and tire that matches everything you mentioned except being black we have the part # AC225R645WS. For a black wheel and tire combo your other option is the part # A225R645BMPVD. The wheel style is modular. What is great about the tires that come on both of these is that they have higher speed ratings of 81 mph when compared to most trailer tires that are only for 65 mph.